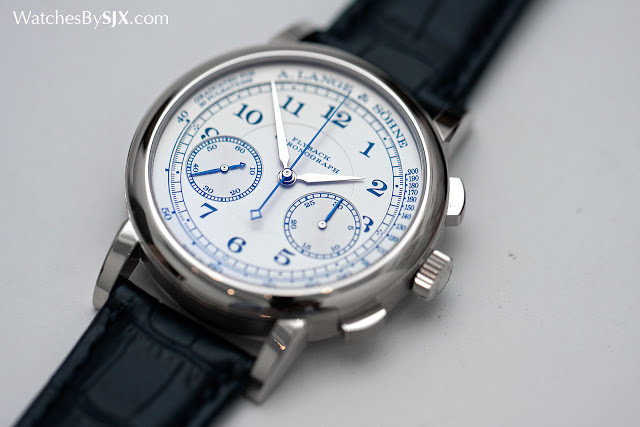 An appealingly facelifted version of the entry-level Lange chronograph, the 1815 Chronograph boutique edition features a pulsometer scale on a pleasing white and blue dial. 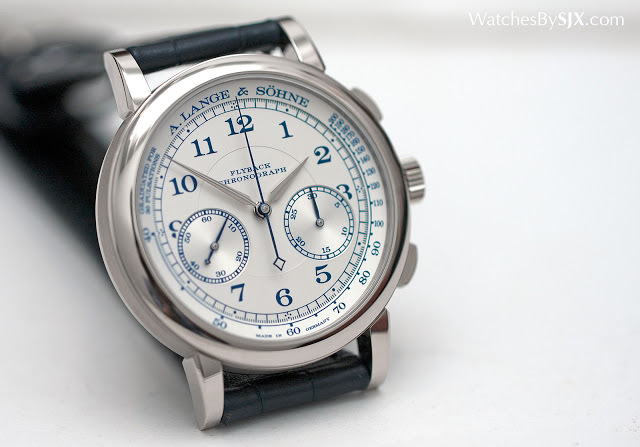 Just introduced at the Watches&Wonders 2015 fair in Hong Kong, the 1815 Chronograph boutique edition is a fine-looking variant of the entry-level chronograph from A. Lange & Söhne. Dignified but still novel in blue and white, the dial features a pulsometer scale, something found only on the boutique edition. All in all, it’s a significant improvement over the regular edition. 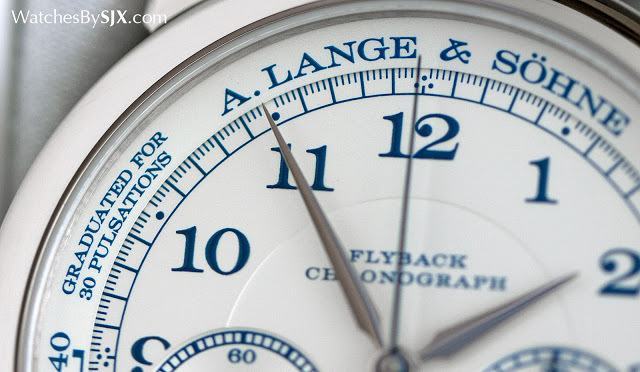 Historically the 1815 Chronograph was the poor cousin of the Datograph, the landmark chronograph from Lange. It uses the same movement, but with the oversized date display removed. 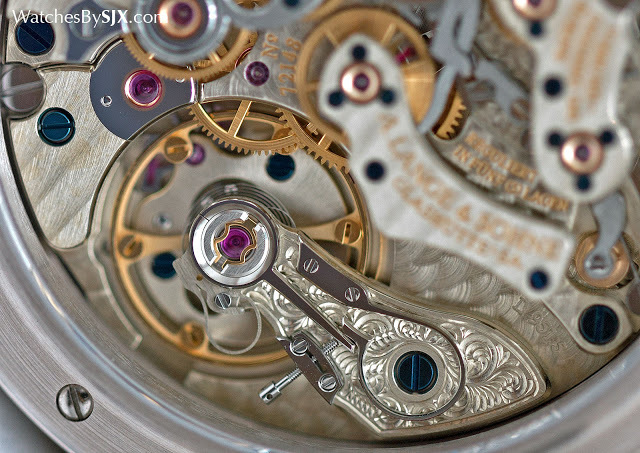 But the sub-dials on the 1815 Chronograph still sit lower down on the dial, instead of at the conventional halfway mark, because the position of the registers cannot be changed without a major reconstruction of the movement. But that’s a forgivable compromise in return for a much more affordable price (the 1815 Chronograph costs almost US$20,000 less than a gold Datograph), as well as a slimmer case. While the Datograph is a chunky 13.1mm high, the 1815 Chronograph boutique edition is only 11mm high, making it as elegant as a chronograph can possibly be. Interestingly, while he 1815 Chronograph boutique edition shares the same 39.5mm diameter as the regular model, the case is different. It has a tiny step at the base of the bezel, a detail found on all the other more recent 1815 models like the 1815 Up/Down and 1815 “200th Anniversary F.A. 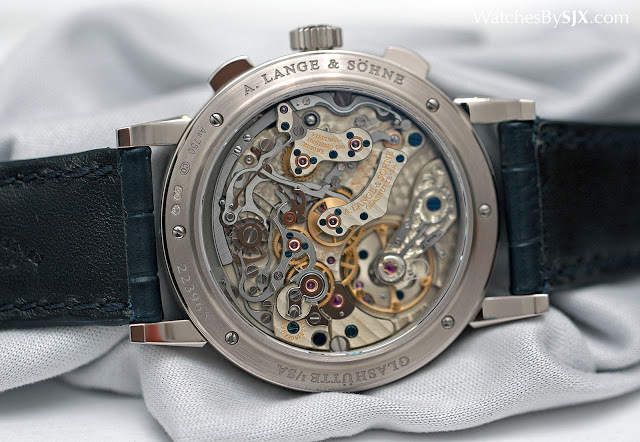 Lange”. The stepped bezel makes the 11mm thick boutique edition imperceptibly thicker than the regular version that’s 10.8mm high. Meant to aid doctors and nurses in measuring a pulse rate, the pulsometer scale was found on the first generation 1815 Chronograph available from 2004 to 2008. On the second generation model introduced in 2010, the pulsometer scale was dispensed with. The result was a cleaner, but somewhat vacant dial. Now the pulsometer scale has returned, improving the proportions of the dial by filling up the empty space. 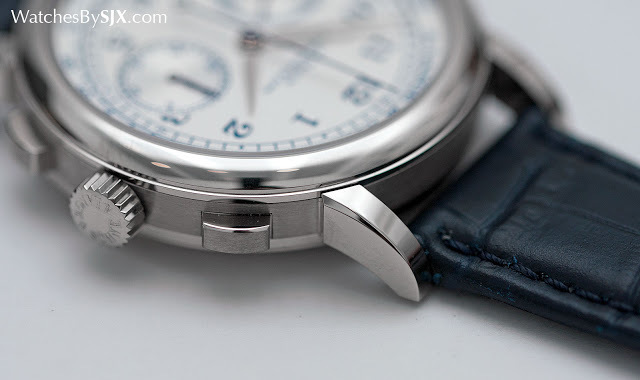 Interestingly, though superficially similar, the dial on the boutique edition is more attractive than the pulsometer dial of the first generation 1815 Chronograph. The new boutique edition dial is slightly different, and better proportioned. 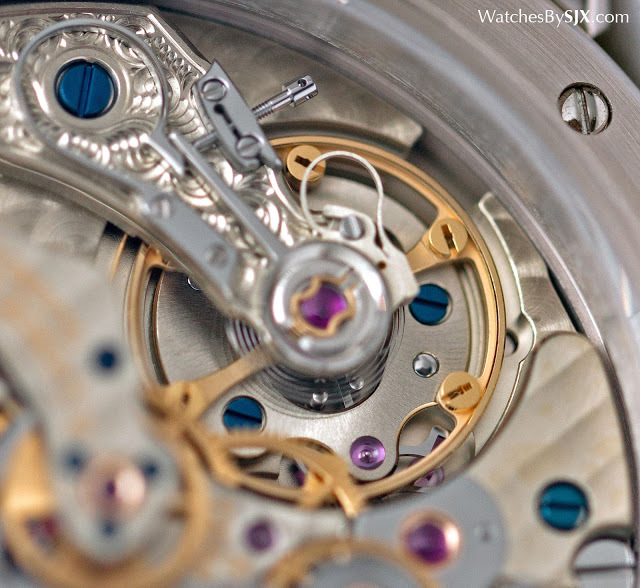 One difference is the width of the chapter ring for the pulsometer – it is narrower on the boutique edition. And the sub-dials also seem larger on the boutique edition, and it also has a simplified railway minute track. In short, the design has improved significantly with the boutique edition. With a colour scheme that is reminiscent of blue and white porcelain, the 1815 Chronograph boutique edition is traditional in form but still unusual. The colours might be a coincidence, but fine porcelain is synonymous with Meissen, a town an hour’s north of Glashütte, the hometown of Lange. 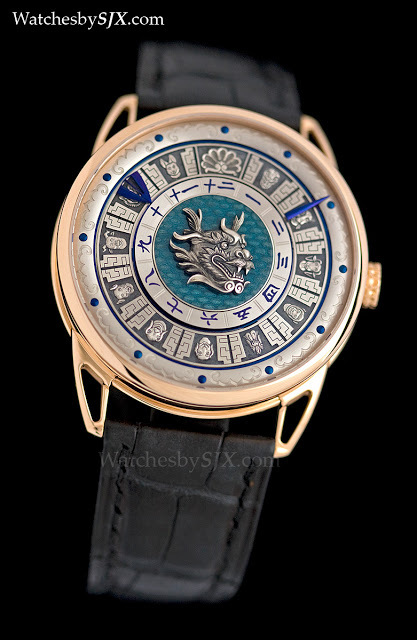 The dial is a matte silver, with dark blue markings. 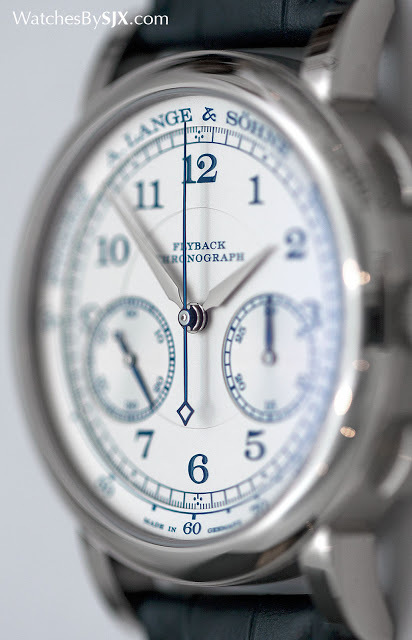 Both the hour and minute hands are white gold, while the chronograph and constant seconds hands are blued steel. Traditionally the chronograph hands should match, while the constant seconds hand (located at eight o’clock) should be a different colour since they serve different purposes. 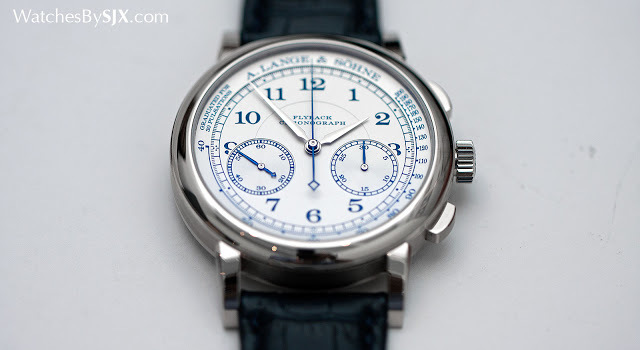 On all Lange chronographs, instead of differentiating them with colour, the style of the hands is different. The constant seconds hand has a long tail while the elapsed minutes hand has none at all. Still the same gorgeous view While the dial has changed for the better, the visuals of the movement cannot be improved. 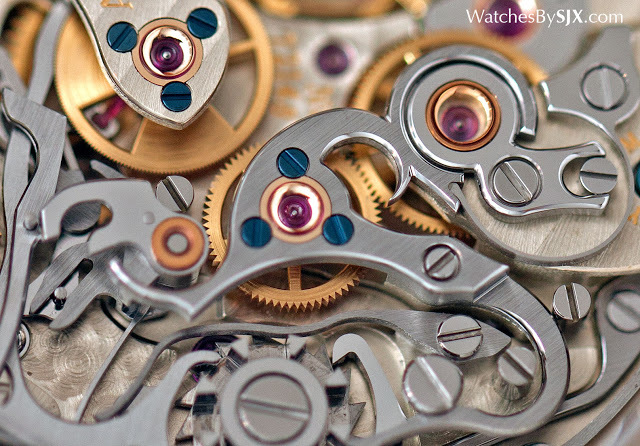 The view from the back is the same one as on the back of a Datograph, revealing the richly coloured, multi-layered movement. 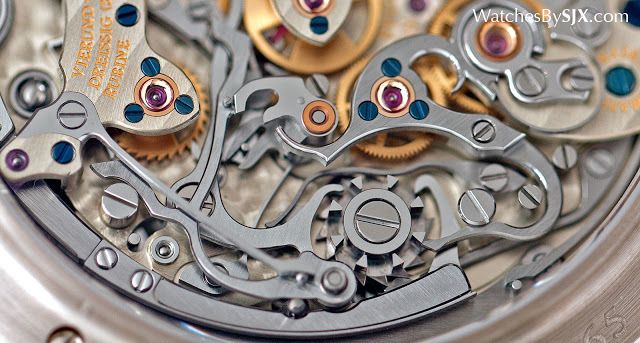 Visually as appealing as the first generation 1815 Chronograph, this movement is a marked improvement over the earlier version. 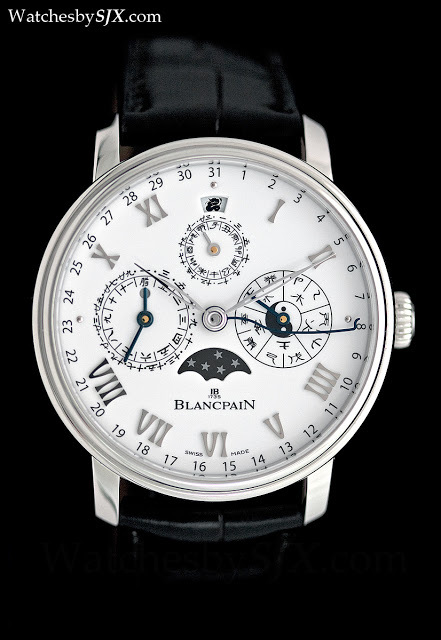 It has a 60 hour power reserve (instead of just 36 hours), as well as an adjustable mass balance wheel. More complicated to regulate, the in-house balance wheel promises a more stable rate over time. 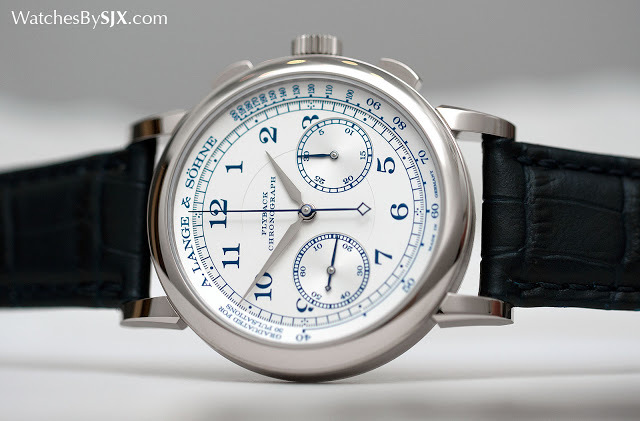 The 1815 Chronograph boutique edition in white gold carries the same retail price as the regular model, which is US$51,500, €49,000 and S$67,700. However, being sold only at Lange boutiques, the effective price is higher, since authorised retailers typically offer discounts that boutiques do not. 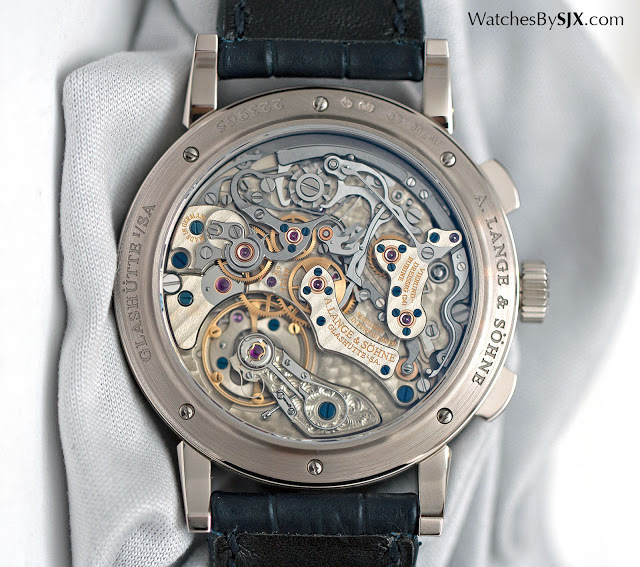 Its qualities, however, make the boutique edition a far more compelling wristwatch than the regular version. 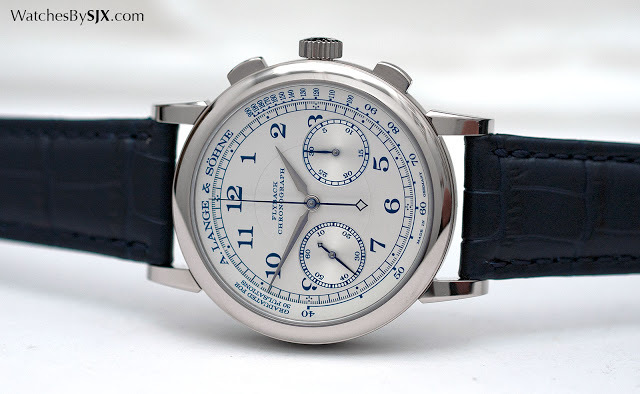 And compared to the equivalent chronograph from Patek Philippe, the reference 5170G, the 1815 Chronograph costs a third less and is significantly better value. The most affordable A. Lange & Söhne wristwatch just got a bit more interesting with the addition of two variants with grey dials exclusive to its boutiques.